The mantra of investigative reporters everywhere is “follow the money.” And no one else follows the money in Indiana education politics as doggedly – some might say obsessively — as Doug Martin. 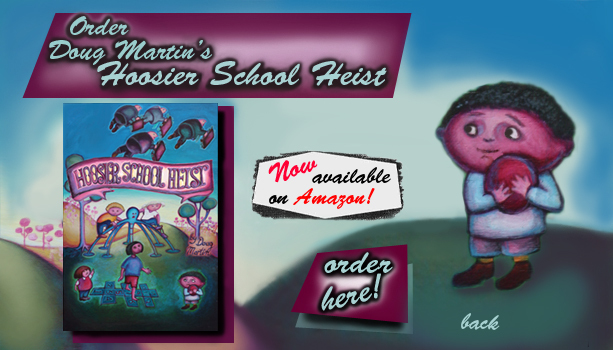 His new book, “Hoosier School Heist,” draws on campaign finance records, foundation tax documents and muckraking reporting to paint a picture of a big-money push to privatize Indiana education with an agenda of vouchers, charter schools and anti-teacher policies. As the title makes clear, this is advocacy journalism. Martin doesn’t make any pretense of being “fair and balanced,” whatever that means. He writes in a tone of sustained outrage, which may be a bit strong for some readers. He would no doubt say that, if we aren’t outraged, we aren’t paying attention. This blog specializes in bad news. But here’s some good news for public education from this month’s elections: Nine of the 10 Indiana school districts that asked voters for permission to raise local property taxes to support education were successful. Prior to this year, fewer than half the referendums that took place since Indiana’s current school-funding laws went into effect in 2008 won public approval. With the May 2014 results, schools have finally topped the .500 mark: 52 of 102 have succeeded. School-funding referendums in Indiana come in two varieties: They can raise taxes to build schools; or they can augment state funding for a district’s general fund, which pays teacher and staff salaries and other operating expenses. Over the years, the mix has been about half-and-half between construction and general-fund referendums. But this year, eight of 10 were to boost general-fund spending. All those proposals passed. Some were close, though; three passed with 51 percent or less of the vote. It’s an appropriate thought as the nation marks the 60th anniversary of the Supreme Court’s Brown v. Board of Education decision outlawing racial segregation of schools. We can congratulate ourselves on the fact that minorities have made substantial legal and economic progress. But in our schools, white children and children of color – and rich kids and poor kids – still don’t get too close. After a few years of progress, schools across America have become more segregated, the Civil Rights Project at UCLA and the Center for Education Policy Analysis at Stanford have documented. Schools in the South have re-segregated; but the most flagrant racial separation is in New York. As Richard Rothstein at the Economic Policy Institute has shown, school integration worked for the short time we tried it. But we abandoned the idea for compensatory education: “separate but equal” redux. State Sen. John Waterman is as solid a conservative as you’ll find: a former sheriff who is tough on crime, 100 percent pro-gun, stingy with money and endorsed by Indiana Right to Life. He has just one flaw, and for a Republican politician, it’s fatal. He supports unions, including teachers’ unions that back public schools. That was enough to get him taken out in last week’s GOP primary after representing his rural Western Indiana district since 1994. The Indiana Chamber of Commerce put a target on his back, ostensibly because he voted against the so-called right-to-work law that Indiana adopted in 2012. The Koch brothers-funded Americans for Prosperity threw in with undisclosed funding for ads. But key money – big, late contributions that may have helped push his opponent, Eric Bassler, over the top – came from forces whose agenda is promoting private school vouchers. Bassler won with 51.3 percent of the vote, even though the Senate Republican caucus backed Waterman. Bassler got $15,230 in the week before the election from Hoosiers for Economic Growth, which is not funded by Hoosiers and doesn’t focus on economic growth. It functions as the Indiana arm of American Federation for Children, a national pro-voucher group led by mega-donor Betsy DeVos. Indiana’s rejection of Common Core standards and its foot-dragging over creating a new testing system earned it a stern rebuke from the U.S. Department of Education. But that doesn’t necessarily mean it’s about to lose its waiver from requirements of the No Child Left Behind Act. New American Foundation policy analyst Anne Hyslop, who tracks NCLB waiver developments, said Indiana may be able to meet the conditions for keeping and extending its waiver. It depends on whether the feds want to play hardball. And there are some indications they may not. For Indiana, the biggest hurdle may be a requirement that it administer tests aligned with “college and career ready” standards by 2015. State law says Indiana must continue to use the ISTEP exam next year, and ISTEP isn’t considered a measure of college and career readiness. “This could be a problem, but it’s really anyone’s guess how the department will work with the states and what the next steps will be,” Hyslop told me. The Education Department awarded Indiana an NCLB waiver in 2012 based on the state’s adoption of Common Core and its participation in the Partnership for Assessment of Readiness for College and Careers, or PARCC, a consortium developing tests aligned with the new standards. But state lawmakers turned against Common Core and this year repealed their adoption. Indiana withdrew from PARCC to create its own tests. Macke Raymond tends to have a favorable view of charter schools, but she’s quick to point out the sector includes effective schools and others that are not so good. “The story is in the variation,” Raymond, director of Stanford’s CREDO and the author of the best-known studies of charter schools, told an Indiana University audience recently. That’s true in Indiana, where a lot of variation seems tied to who authorized the schools. 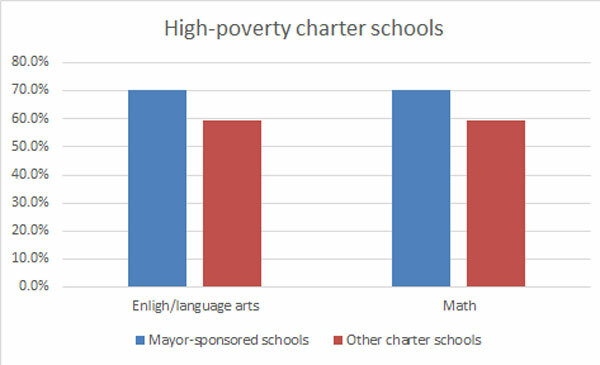 A 2012 CREDO study found that schools authorized by the mayor of Indianapolis did better than other charter schools, most of them authorized by Ball State University. A look at high-poverty schools – where more than 80 percent of students qualify for free or reduced-price lunch – shows the pattern held for ISTEP results in 2013, the last year for which scores are available. Over 70 percent of students in mayor-sponsored schools passed the tests, compared with less than 60 percent in other charters.